In the hands of marine pilot Sergei Larenkov, a camera turns into a time machine. 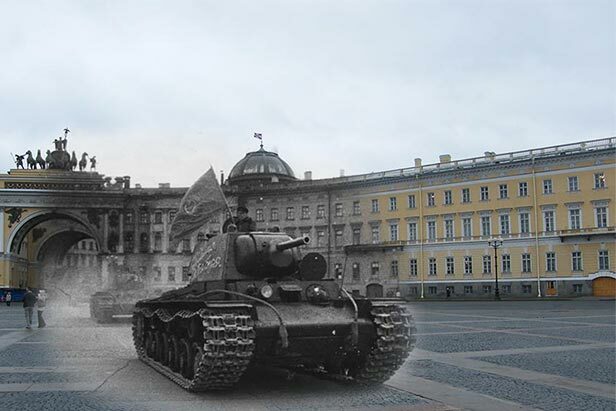 For six years, Larenkov has spent his spare time making photo collages, creating mash-ups of archival wartime photos of Russian and European cities with photographs of the same places today. 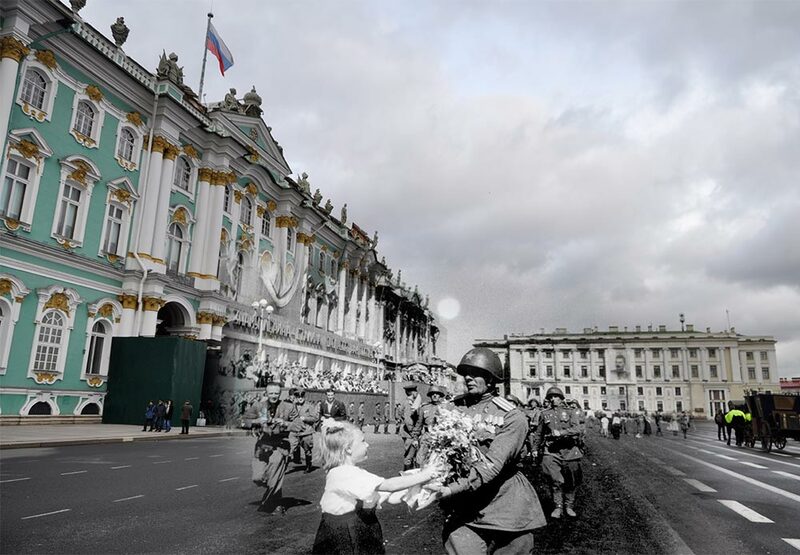 / Moscow, 1941-2010. Parade on November 7, 1941. The troops marched straight to the front line. Sergei Larenkov tells about his project: “In 2009-2010, I did a project in Moscow. That was followed by Europe (cities that were the focus of the fighting during World War II) – Vienna, Prague, Berlin, Paris, Normandy. Then came Kiev, Odessa, Sevastopol, Kerch and many others." 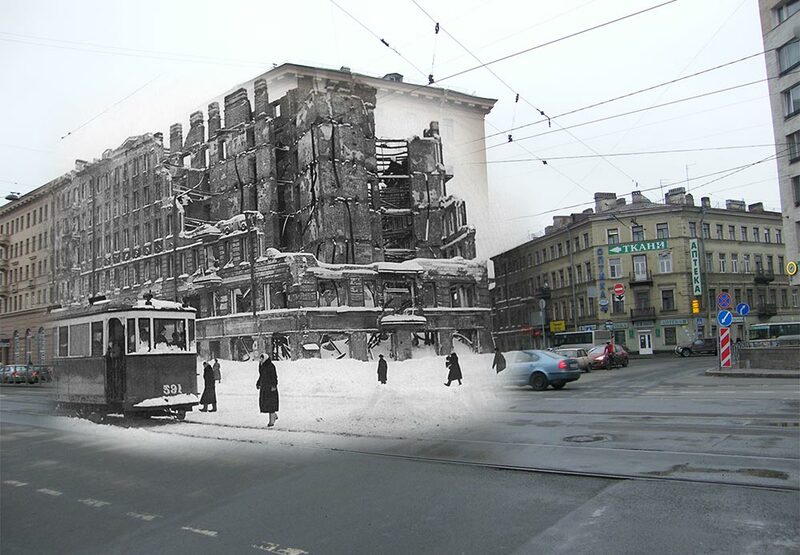 / Leningrad (now St Petersburg), 1942-2009. Intersection of Ligovskoy Prospect and Razyezzhaya Street. "In 2014, I managed to extend the project to include Dresden, Novorossiysk and Murmansk. The entire project, ‘The Link of Times,’ includes more than 1,000 works.” These cities were awarded the title “Hero City” (Russian: Gorod-Geroy) for outstanding heroism during World War II. Twelve cities of the Soviet Union were honored: Moscow, St Petersburg, Volgograd, Kerch, Kiev, Novorossiysk, Sevastopol, Murmansk, Brest Fortress, Odessa, Smolensk and Tula. They are Sergei Larenkov’s main interest as he studies the cities that played a decisive role during the war./ Leningrad (now St Petersburg), 1941-2009. Palace Square. KV-1 heavy tank. “It's incredibly interesting for me to touch the history, to show the scale of the past wars and their aftermath, to pay tribute to the heroic deeds of our people. 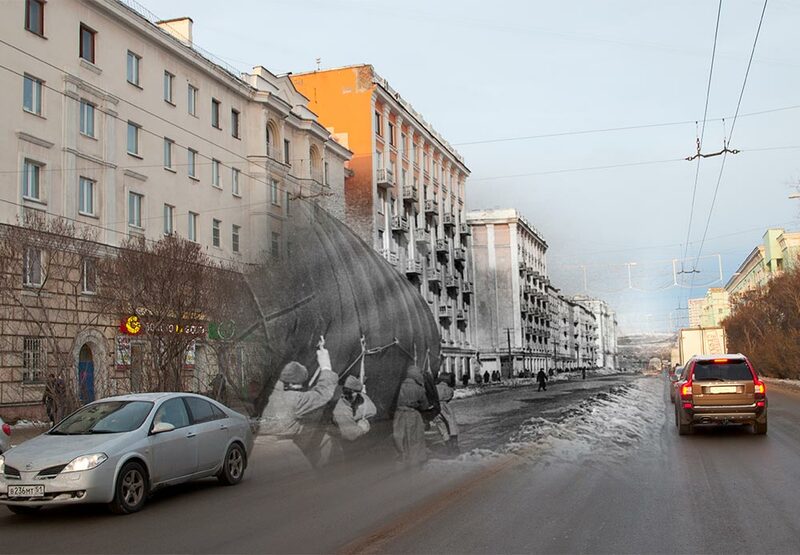 “ / Murmansk, 1941-2014. Transportation of an aerostat. 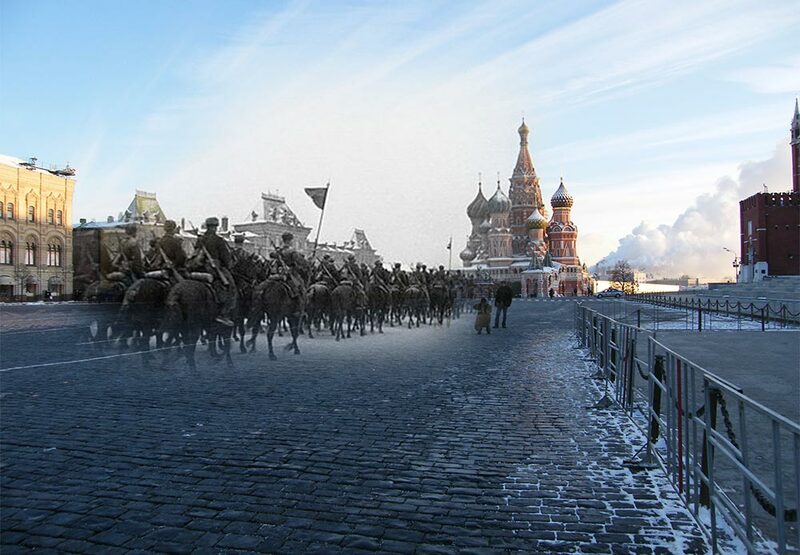 Moscow, 1941-2012. 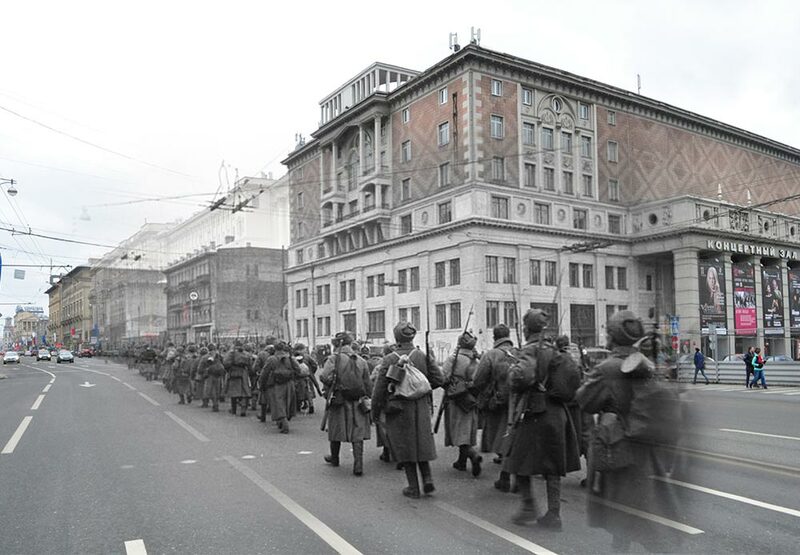 Rank-and-file soldiers on Tverskaya Street. 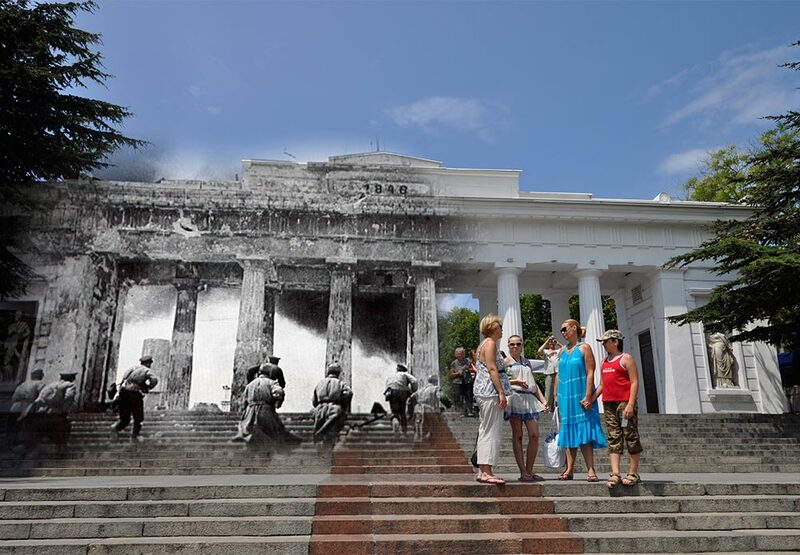 Sevastopol, 1944-2012. Assault of Grafskaya Pristan (Count’s Quay). 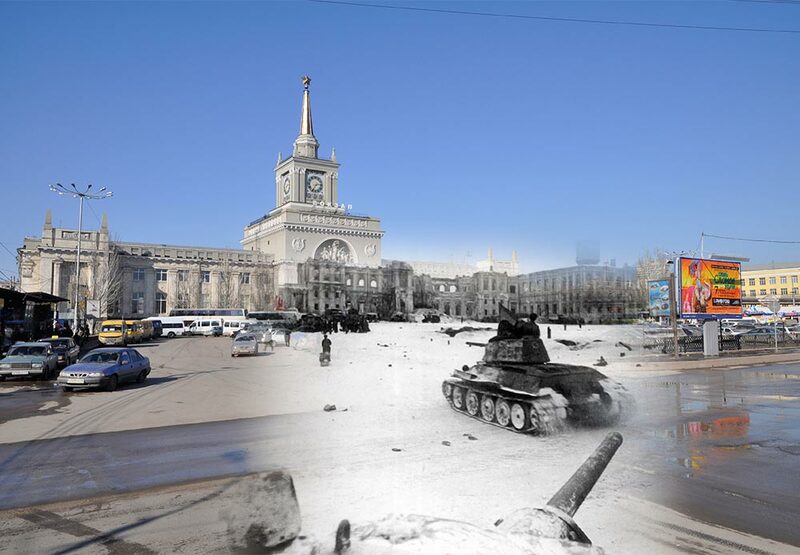 Stalingrad (now Volgograd), 1943- 2013. Soviet T-34 tanks near a railway station. Novorossiysk, 1943-2014. Soviet navy flag atop a monument to Vladimir Lenin. 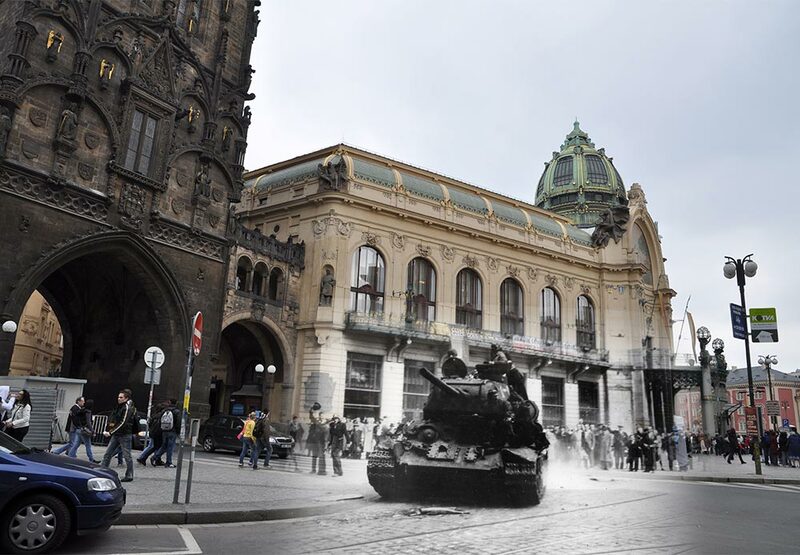 Prague, 1945-2010. Citizens welcoming their liberators near the Powder Gate. 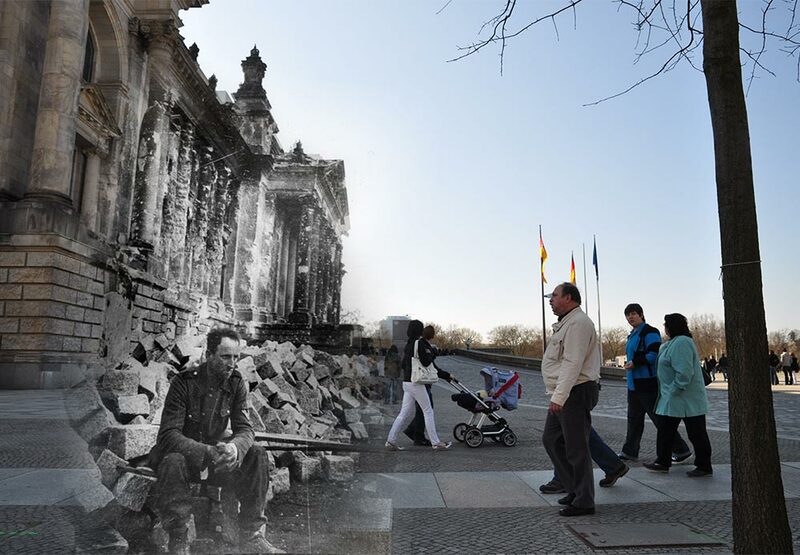 Berlin, 1945-2010. Storming the Reichstag. 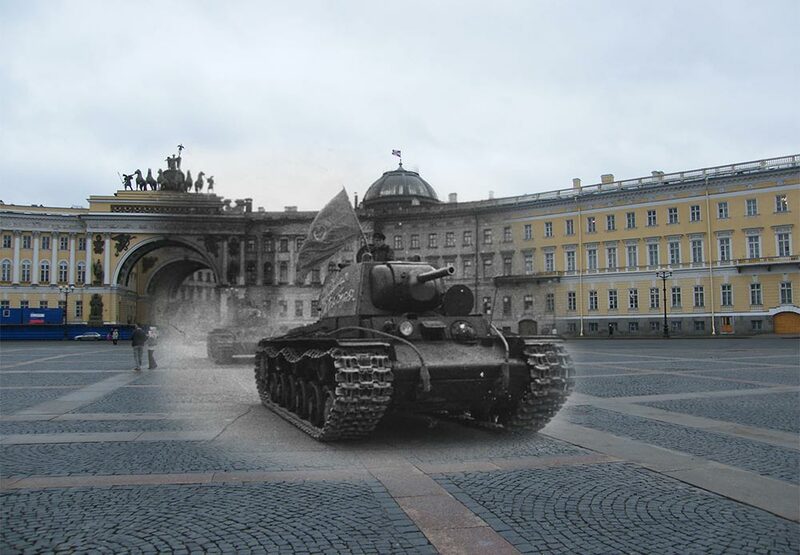 Berlin, 1945-2010. 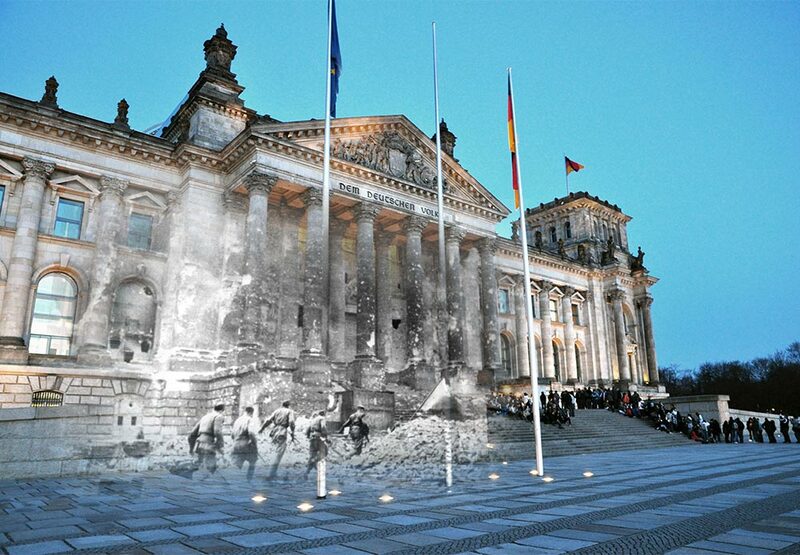 German soldier in front of the vanquished Reichstag. 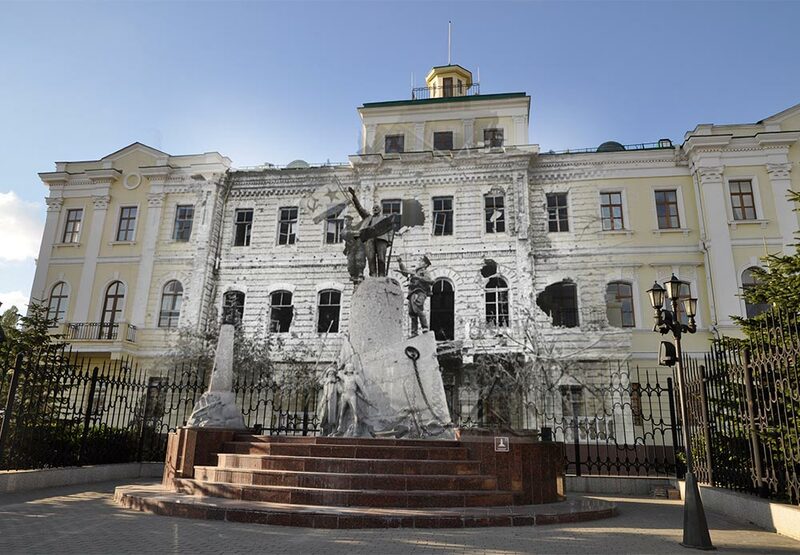 Leningrad, (now St Petersburg), 1945-2013. Meeting of Soviet soldiers on Palace Square.